The following is a guest post by Dan Vuksanovich of WhyISuckAtGuitar.com. If you are interested in guest posting, please contact me! I’m a classically trained guitarist and a former information technology consultant, which makes me a guitar nerd with an insatiable craving for the latest and greatest technology. I also play in a local cover band, for which I need a tonally flexible rig which is easy to transport and doesn’t break the bank. The solution? You guessed it: amp and effects modeling. My rig consists of a Line 6 HD500 with a QSC K8 powered PA speaker for stage volume. That’s it. All my gear combined, including my guitar, weighs less than fifty pounds. I used to drive a Mini Cooper and had room for all my gear with tons of room to spare. While our other guitarist and bassist are lugging in their tube half stacks, I’m at the bar having a beer. Not all modelers are created equal – There are lots of wild claims out there about tone quality by companies that make amp modelers and multi-effects units. The problem is that tone quality is subjective, so the manufacturers can basically claim whatever they want. Now, I’m not going to tell you what you should and shouldn’t buy, but I will say that if you buy a $99 entry-level modeler, don’t expect it to sound like a $3,000 Axe-Fx. My POD HD 500 cost about $500, and for my purposes it gives me the best bang for the buck. It might not sound 100% as good as an Eleven Rack or an Axe-Fx, but let’s be honest here, I play at local bars and clubs, not Madison Square Garden. Your home amplification method matters – The way you amplify your modeler when you’re not playing at a venue is a huge consideration. The goal here is to make your bedroom setup as much like a live setup as possible. Enter the QSC K8 powered PA speaker. Yes, it cost me $600. 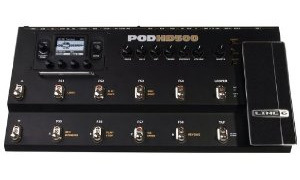 Yes, that’s more than the cost of the POD, but I need to be able to hear what my tone will sound like when I get to the venue, and what better way to do that than with my own personal PA? Let me state the inverse of this for total clarity. If you run your modeler through an amplifier, even if it’s directly into the effects loop, the amp will color the sound… a lot. Therefore, if you try to go direct into a house PA after you’ve tweaked your sound through your amp, you’re in for a shock because it will not sound even remotely like you remember it sounding at home. What you need is a full frequency, flat response (FRFR) powered PA speaker. This works out perfectly because at home the PA speaker will be your amp, and at the venue you can use it as a personal monitor for stage volume that you can control. Be the opposite of a kid in a candy store – All those models! All those effects! I can make my guitar sound like an alien spacecraft if I want to! Time out. Listen, there might be 600 amp models and 4,000 effects to choose from, but all you really need is a few usable live sounds. I’ve got four: acoustic, clean, crunch and saturated. Instead of going crazy and filling up every available effects slot just because it’s there, spend some time researching a typical signal chain for the type of sound you want. For example, my saturated sound is the one I use most on stage, so I needed to make sure that it was just right. I started with the assumption that I would use one of the high gain amp models, noise gate, reverb, and potentially a distortion pedal to smooth out the gain. I’ve got a bunch of empty effects slots and one empty amp model slot (I could run amp models in parallel if I wanted to) but my sound is just the way I want it. Listen… really listen – There are plenty of ways to dial in awful tone with a modeler. You’ve got to use your ears to find something that works, probably even more so than with a real amp. Being an 80’s metal guy, my initial assumption was that I would use the Marshall high gain amp model. No matter what I did, though, I couldn’t dial off the shrill high end on the Marshall. I tried the Mesa Dual Rectifier model instead, and it was perfect. It gave me exactly what I wanted: a sleazy, nasty tone at the lower frets for chugging and riffing, and a sweet singing tone at the higher frets for soloing. I experimented with a few distortion pedal models to smooth out the gain as much as possible, but couldn’t find one I liked, so I decided to try compression instead. Bingo! That was the one missing ingredient and it completed my saturated tone. Some sound guys will help you – One night we had a sound guy who I thought was just interested in insulting my rig again, but it turned out he wanted to help me out with my sound. There’s a difference in volume between bedroom and stage can create some EQ problems. At bedroom volumes my sound was not quite powerful enough so I cranked up the bass, which sounded great. At stage volume, though, the bass simply too much and the sound guy told me as much. He used his equipment (and his ears) to help me EQ, and I’ve had those settings dialed in ever since. He also helped my fine tune the levels of my patches so that I could switch back and forth without forcing him to use the faders to bring the volume up or down. Modeling isn’t perfect, and it isn’t for everyone. Does our other guitarist’s tube half-stack sound better than my POD? A little. Is it worth it to me to lug around over 100 pounds of gear in an SUV to make my tone a little better? Absolutely not. Ultimately you’ll have to make your own decision, but I can assure you that quality live sound with a modeler is possible. You just have to avoid the pitfalls. Great article. I used a Digitech Rp1000 in a coverband setting and I wish I had done the PA thing like you. I always ran it through my amp and it always sounded different on stage then it did at home through headphones. I actually just did an article about it here on Effects Bay. There’s a link to it where I go through some of my models. I’d like your take on it. I tried using my HD500 in a live setting with both the 4 cable and 2 cable method, through the front of the amp and through the effects loop of my Mesa Boogie and the feedback is horrendous.. maybe i have it setup wrong.. but i just use this to tune my guitars on the road bench and thats about it. I’d be curious to hear your setup. Another great tip for these units: Use the onboard EQ. I had to use one of these units last year while on vacation, sitting in with a band I used to play with back home. I didn’t have my ’79 Marshall and pedalboard with me, so I had to make do with an HD500. At first, I was absolutely horrified by the shrill high end and horribly ill-defined bass, but I quickly realized that I was working with a unit designed to adequately process ALL frequencies, not only the ones that sound good for guitar. Pulling up the EQ menu, I was able to cut everything below 90hz (some models around 110hz) and generously shave off everything above 4-10Khz. This made all the difference, truly; all of a sudden, Marshalls sounded like Marshalls, AC30s had chime without brittle treble harshness, and even the one metal sound I used remained tight without losing all definition. Puishin, sir… hats off to you. Suddenly I’m back in love with my POD HD500 thanks to your global EQ tip!